“Our fight today is to demarcate our space on the screen, when we can no longer demarcate our lands.” I cite Ailton Krenak, one of Brazil’s most influential Indigenous leaders, at his keynote address at the opening of the Cine Kurumin film festival in Salvador, Brazil, to engage with cinematic languages on the margins of dominant media. I experience the festival as an active immersion into imaginaries that forward the process of “decoloniality” (Mignolo). 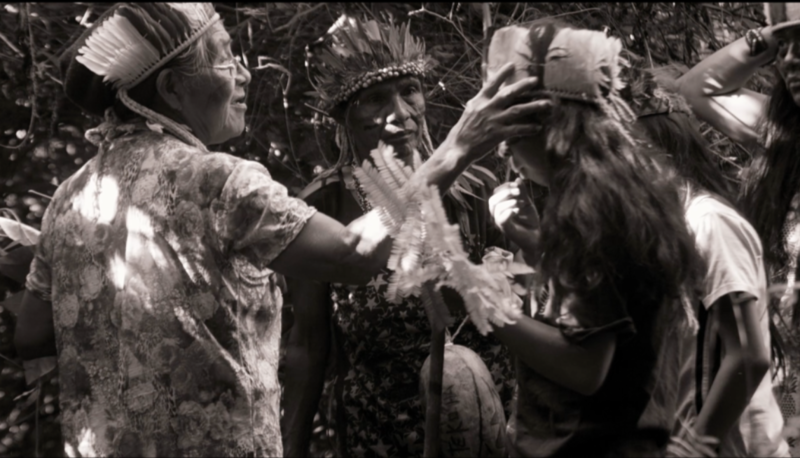 As Sueli Maxakali articulated during a roundtable of Indigenous women filmmakers, the Shaman must dream in order to choose the name of the films made in her community. The production processes of these films were conceived outside the structures of any capitalist market economy; rather, the festival offered an alternate space to take a deliberate leap into expressive audio and oral visual experiences, cultures, languages, politics, and imaginaries resisting ongoing violence entrenched in capital and coloniality. Through a discussion of the festival curation, roundtable discussion, and through a film analysis, I elaborate how the sacred, spiritual, and social are constituent elements of cosmopolitical visions. I argue that film and video as cosmopolitical technologies are unsettling established conceptions of nature and culture, of politics and representation both on and off-screen. Witnessing the Cine Kurumin festival – the totality of the experience becomes an immersive and transformative space for decolonizing the imaginary while disturbing hegemonic political, conceptual, and representational agendas.